Uber today announced an update to its app that makes it easier to hail a ride and set a destination directly to person in your iPhone contacts list. 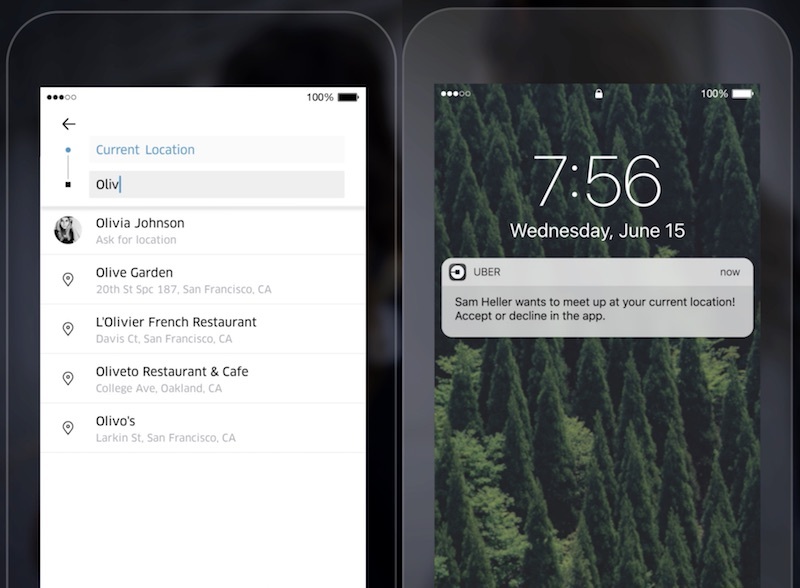 After syncing contacts to Uber, users can type a friend's name into the "Where To" box in the app, and Uber will then send a request to that person to share their location with you, which can be set as a destination. The app can also update friends and family with a feature that sends your ETA to their phone as you ride in the Uber and make it closer to the drop-off point. Following negative reactions to background location tracking, some users might be apprehensive about sharing their contacts list with the app, however. Where are you? Where’s that again? These are common questions we ask friends and family when meeting up. If you’re catching up with friends when out of town, meeting your sister at the mall, or joining coworkers for drinks, now you can skip the back and forth. Just Uber directly to them! So skip the back and forth, forget the address, and get straight to whom you’re meeting up with. In addition to the new contacts sync update, Uber is also introducing Snapchat filters and direct integration with the popular photo-sharing app. Riders will be able to unlock "custom Uber filters" during a ride, including an ETA filter that includes the text of how long is left on a trip. The Snapchat integration can be found in each user's feed in Uber. Quite a few people use Uber to be able to go out, have some drinks WITH friends and not worry about DUI. Be a man, and get some friends and try it sometime. So now they know where your friends live. Why does Uber need to know my location at all times and access to my friends and their location? Time to switch to Lyft. I urge everyone to continue rating and reviewing the Uber app. For weeks they have been pushing through app updates every few days to wipe out all of the previous poor ratings/reviews due to now requiring always on location. I for one am not letting them get away with this and re-post my negative review every time they push out a update.